Just as in the case of several other Hindu festival, many traditions and rituals are associated with Teej celebrations। On Teej, women keep fast and perform other customs for long and healthy life of their husband. Every ritual has its own significance and so ladies perform all Teej customs with extreme devotion. Women start preparing for Teej well in advance and go out shopping to bring all the items used in performing Teej rituals. Teej customs and rituals make the festival more interesting and full of colors। Women who observe fast for their husband take proper care that no carelessness is committed while carrying out the rituals. Teej festival calls for performance of all rituals seriously if one wants to be blessed with marital bliss. To celebrate the auspicious occasion of Teej, women perform some serious rituals. It is customary for married women to return to their parents' home at the time of Teej. Married women and engaged girls get lot of presents from their father-in-law as per Teej customs. A traditional gift package called 'Shrinjhara' or 'Sindhare' is gifted to their daughter-in-law. This traditional name originated from the Hindi word shringaar meaning adornment. Shrinjhara package consists of Ghewar (sweet), traditional laheria dress (tie & dye), henna and lac bangles. All these items are used by the ladies to adorn herself. Baya is another traditional package given to women observing fast on Teej. It includes dry fruits, mathris, new clothes, bangles and jewelry. It is given by mothers of the newly wed girls on the Teej Festival day. On Teej, both married and unmarried girls dress up in traditional colored clothes. Women are usually seen in auspicious red, green and yellow colored lehangas, suits and sarees. Women start shopping for Teej well in advance. It gives them the opportunity to look beautiful of all. The most important ritual is to beautify hands with special mehandi designs and alta. Girls and women apply intricate patterns of alta and mehandi to their hands and feet. This is also a part of Teej Shringar. Women usually hide name of their love in these mahendi designs and later ask them to find out their name. This tradition becomes a playful activity and adds vigor to the day's celebration. Ladies also wear new gold and diamond jewelry. Some women wear very heavy jewelry while some wear light jewelry. Women have full liberty to ask for anything they wish. Even their husband do not stop them from doing anything and gift them whatever they desire as they starve themselves for well-being of their husband. The most important ritual of Teej Festival is Teej Fast. Women and unmarried girls keep fast for long and healthy life of their husband. Teej fast goes for 24 long hours. It is the most rigorous fast in which a woman neither drinks nor eat. As per the ritual of Teej fasting, a woman should keep an oil lamp lit all night। If the oil lamp dies away, it is considered a bad omen. The most important ritual of Teej is to bedeck Parvati Mata and carry out auspicious processions on the streets. Idol of Goddess Parvati is decorated with fine jewelry and new colorful clothes. The fasting day of Teej is very vital as women pray to Goddess for marital bliss and happy life. Last but not the least, swings are the common sight when Teej is near. Beautifully decorated swings are hung from trees in the garden and gaily dressed up women swing and sing traditional Teej songs. Some women also dance while singing the holy songs. Teej celebrations takes place in various parts of Rajasthan, Punjab and Gujarat. Being an important women festival, Teej is celebrated with full verve and enthusiasm. It is held to mark the advent of monsoon season and also a very important festival for engaged and married women. On this day, women pray to Goddess Parvati for long and healthy life of their husband. There are many activities performed by women to celebrate the holy festival of Teej. Women feel immense pleasure in celebrating the festival and make various preparations before hand. Teej commemorates the reunion of Lord Shiva and Goddess Parvati. 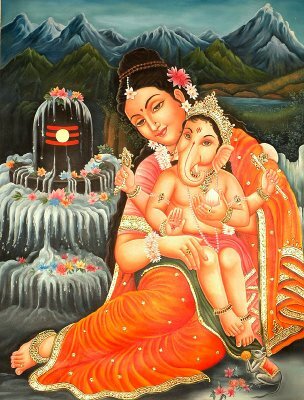 It is believed that Goddess Paravati took 108 births to have Lord Shiva as her husband. Since then it is proclaimed that who so ever worships Parvati Ma is blessed with happy married life. At the time of Teej, women observe Nirjara Vrat so that Goddess Parvati becomes happy and bless their husband with long and healthy life. Teej is celebrated in a very colorful way. Women start preparing for Teej a week before the festival. For Teej celebration, women buy new clothes, jewelry and accessories to wear on the festival day. Markets are usually crowded with women shopping for various items to adorn oneself. On Teej, women try to look as beautiful as they can. Intricate mehndi designs are also applied to hands and feet. On the main Teej day, women even visit beauty parlors. Women spend a lot of money of Teej preparations. Even husbands do not say anything to their wife and help them in festival preparations. Teej celebrations are not only confined to the women celebrating the festival. Teej celebrations take place round the city. A special Teej procession is organized in which the bedecked idol of Goddess Parvati is kept on a palanquin and carried out in the procession. Numerous artists, performers, band members and folk dancers follow the procession showing their magnificent skills. People dance down the streets along with other performers as they completely engross in Teej festivities. Apart from this, women love to celebrate the festival by making their own special arrangements. Beautifully decorated swings are hung from trees and attractively dressed women dance and sing various Teej and Sawan songs. Fragrance of flowers on Teej swings pervade the atmosphere. After this, women offer prayers to Parvati Mata and the Teej Vrat successfully completes. At the end of the day, husbands come to pick their wife and sometimes even bring presents for them. This way Teej Celebrations bring lot of happiness for both married and unmarried couples and create some everlasting memories. Teej honors Goddess Parvati – symbol of utter devotion and love. Hence Teej is also called Teej Mata Festival. Both married and unmarried Hindu women observe the three-day-long festival seeking blissful married life and happiness for their husband. Teej festivities and its celebrations are dedicated to Goddess Parvati this is why it's purely a festival of womenfolk. The divine figure of Goddess Parvati is worshiped with earnest dedication at the time of Teej. The day's celebration has an ancient legend associated with it. It is said on this day Goddess Parvati reunited with her consort Lord Shiva. Mata Parvati went through rigorous fasting and a penance of 100 years. She took 108 births to be accepted by Lord Shiva in the form of his wife. Even today the auspicious day is celebrated to honor Goddess Parvati for her true love and positive spirit. And since the celebration of Teej totally relate to Goddess Parvati, so she is also called Teej Mata. On the last day, Teej idol is taken out from the pat (holy place where she is kept). The idol is freshly painted and bedecked with pure gold and other fine jewelry. Bright colors are used to decorate the Goddess. The idol is offered fruits, milk, chapati, nookti, ghewar and pure jal by saints performing prayers and chanting holy shlokas. Teej idol covered with a canopy is taken out in the procession. Specially decorated 'band baaza' with a team of performers precede the procession. The 'Teej Mata Palki' or 'Takht-e-Rawan' is carried by 8 men dressed in red color. In the Pink City of Rajasthan, Jaipur where grand celebrations for Teej takes place carries out Teej Mata in a royal procession from the city palace so that the general public can pay homage to the festival Goddess and get their desires fulfilled. In the Teej Mata procession there are around 10-12 elephants, 16 well-adorned horses and performers including dancers, singers and folk-artists. Beautifully decorated camels and bullock carts are an added attraction to the festival procession. Bhog is also given to the devotees who come closer to pay homage to the deity. There is a huge rush to have a single glimpse of Teej Mata Palki. People in colorful traditional dresses even reach the top of houses and tree tops to have a splendid view of the holy procession. As the procession moves forward people keep offering precious ornaments to the idol. The time when “Mata” is about to reach back its place, the idol gets almost covered with gold and silver jewelry. Teej Puja is a vital part of Teej celebration. Women, both married and unmarried, start preparing for the final puja well in advance. The verve, enthusiasm and devotion is apparent on their face. On the puja day, women wear new and beautiful clothes. This is the day to look best of all. Teej Puja is not a very long affair. Women read aloud the Teej Katha and offer their worship to Goddess Parvati. Lot of activities and rituals are performed at the time of Teej Puja. Attired in traditional sarees and lehangas, women congregate in a temple to worship Parvati Ma, who took 108 births to reunite with Lord Shiva. On this day, idol of Goddess Parvati is bedecked with rich silk cloth and heavy jewelry. This day is considered very important as married women and engaged girls observe fast for long and healthy life of their husband and to-be-husband. Women either gather at a nearby temple or a garden where the puja is arranged. The main puja takes place with holy offerings of flowers, sweets and coins. A semi-circle is created and an idol of Goddess Parvati is kept in the middle. A pujarin or all the ladies together narrate the holy Teej Katha. Young girls also sit to listen the auspicious katha. While listening to the katha, women are expected to put their mind and thoughts towards their soul mate. When the puja gets over women offer fruits, flowers and other holy items and seek blessings of Goddess Parvati for marital bliss. Another very important part of Teej Puja is the oil lamp which should be kept alight throughout the night as it is bad omen if it dies away. At some places, after paying homage to Goddess Parvati, women bath with red mud found on the roots of the sacred Datiwan bush. This is an act of purification. It is believed that a woman is absolved from all sins after taking this holy bath. At the end of the day, women share their happiness and joy by dancing and singing traditional songs in praise of Lord Shiva and her consort Parvati.